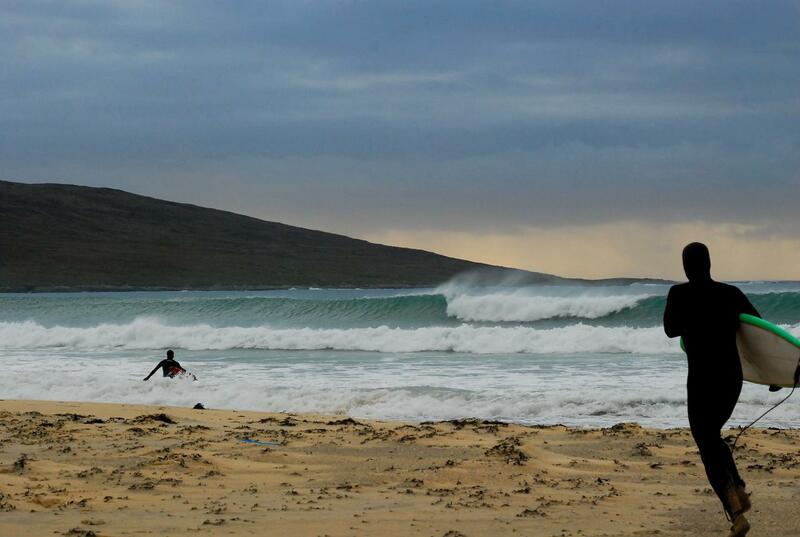 Based in the Hebridean Islands or North Coast of Scotland these surf courses are the best thing we do! Beautiful locations, empty beaches, experienced instructor/guides and consistent surf make for an ideal surf holiday. We offer a structured week with high quality instruction. Morning group lessons with the afternoon supervised free surfs! Time to relax or surf to your arms can't move with our staff enjoying individual tips. The evenings are spent by beach fires, watching sunsets, relaxing, surfing again or at the local pubs discussing the days events and the local hospitality! Five full days surf coaching (Monday to Friday). Guides to the best places to surf each day, have fun and eat. Free transport (if needed) from the island ferry port to the campsite (islands) or Thurso train station to campsites (north coast) and daily transport to the beaches from our campsite location. Food, tents (available to hire), ferry tickets foot passenger is £30 return (Islands) . ISLANDS We meet you at the Island Ferry port on Sunday evening and get you back on the early Saturday ferry. Details for ferry bookings and island locations will follow in confirmation email. NORTH COAST We meet you at the campsite Sunday evening and say goodbye early Saturday morning. For those wanting to use public transport we can do an agreed evening pick up in Thurso on the Sunday night at 2200 with return to Thurso 0830 on Saturday morning to tie in with trains. We can also recommend car shares with other customers for those without transport. If you have any further questions. Get in touch by email (surfing@c2csurfschool.com) or call (07971990361) to find out dates.